The Silver Chair — Notorious M.L.E. Right before we left Arnold and I were arguing/debating about whether to bring our umbrella stroller. We were bickering about this up until the last minute. Lucky Em D. got to see us continue this argument up the night before we left. Arnold wanted to leave it at home because it was one more thing to deal with. I wanted to bring it because I thought it would make our 5 hr layover in Houston not as heinous on the way back. I ended up winning because, well I am very stubborn. Thank God I did though because now we call it the “magic stroller”. It magically calms Elian down when he is fussy. It magically puts him to sleep in the afternoon when he is tragically tired but still unwilling to take a nap. And it magically saves us from carrying around our 10 Kilo toddler all over Bogota which saves us many, many chiropractic bills. Anyways, we love it and I can’t imagine how many more battles we would’ve had without it. One especially sweet day Elian pulled his hood over his face and put himself to sleep. Why thank you magic stroller! To all the future adoptive parents who follow along: If you are not going to be in Bogota or a big city like Medellin it might not be as useful to have a stroller. The streets of smaller towns are not always well paved also some cities are just a nightmare traffic wise. 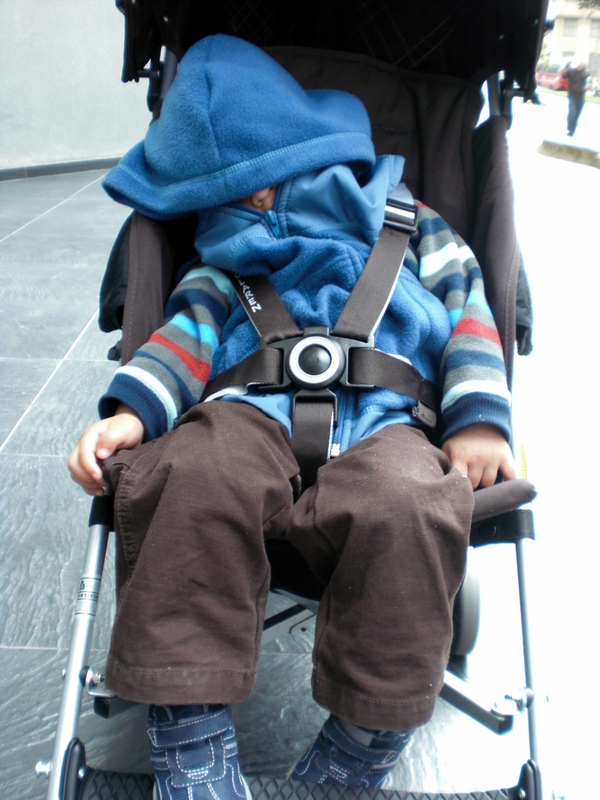 We took the stroller to Bucarmanga one day and it was just not safe crossing the streets there. For that I would suggest bringing an ergonomic carrier. We have one and it works as well as the stroller plus gives us the use of our hands! This is a bonus when you are trying to pay the bus driver while holding your wiggly toddler. Elian really loves his and it's also nice to carry your child close for bonding and attachment reasons. Posted on January 10, 2010 by La Emily and filed under Adoption and tagged Elian- Adoption.